I decided to give the regular, over-populated New Year post a miss this year, and focus on the wonderful clear writing time I had over the holiday period, but normal service will resume shortly! 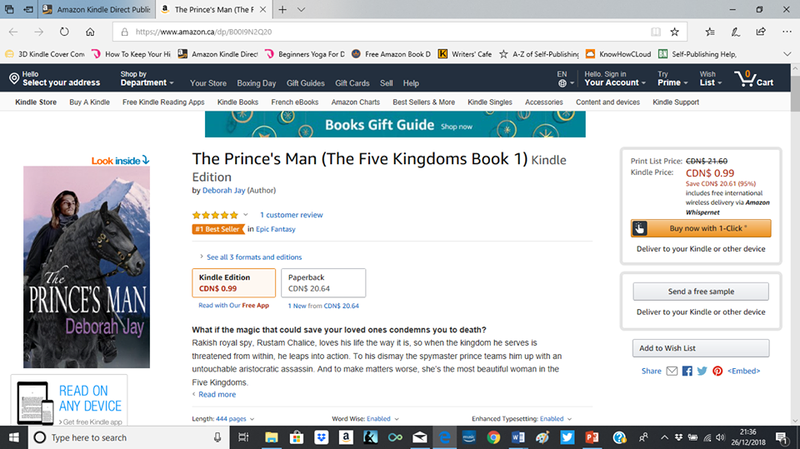 On the writing note, I’m thrilled to report I’m in sight of the end of book #3 of The Five Kingdoms series, THE PRINCE’S PROTEGE. I have around 2 and a half chapters left to go, which I plan on completing before the end of this month. With editing time, and the delivery schedule on the cover taken into account, I’m planning on a mid to late March release – woohoo! However, as so many people are reporting, sales towards the end of last year were down – this promo sold around 500 books, in contrast to last year’s 1000. Perhaps that’s because lots of the same people saw the ads? I don’t know the answer, but at least I have another new batch of people reading book 1, and quite a few continuing on to book 2, which is why I’m so keen to get book 3 out asap! On that note, I’m going back to it now, see you when I crawl out of my writing cave again! That’s awesome, Deborah. Gotta love those orange Best Seller banners. Wishing you a successful new year with your new release. Thank you! I’m liking the look of your new spec fic photo prompts. Not sure I’ll have much time to write, but I’ll enjoy seeing the pics you come up with and I’ll have a go if I can. I’m only doing one a month, to take the pressure off everyone – and me. Lol. I’d love to have you participate when time allows. There are a lot of long submissions, but short flashes are totally welcome (and more likely to be read). Thanks so much for your interest! If I manage it, it will definitely be a short! Congratulations, Deborah! I didn’t even know about that orange tag. Woohoo! A question for you if you don’t mind sharing your expertise: I notice your book covers for Prince’s Man and Prince’s Son are similar–a noble character on a horse against a natural background. I love them both. I’m working on the book cover for Book two of my trilogy and it strikes me, the cover would probably be similar to Book 1 though I thought I shouldn’t do that. Maybe it’s OK–based on your experience. How did you come around to those two book covers? I’m kind of rambling–sorry! Any help would be appreciated. You should take a look at lots of series covers – the idea is to make them instantly recognisable as part of the same series. My third will also feature a nobleman on a horse, but this time a chestnut horse, and in front of buildings. Its all about that wonderful word – ‘branding’. Readers should be able to look and know each book is linked. Scroll to the bottom for links to the monthly posts, and prepare to lose loads of time – it’s fascinating, and wonderfully educational! Thanks so much, Deborah. I will do all of that. I could use a break from writing right now so I’m off to check out that link.